Welcome to www.AffirmWare.com.au, a leader in Personal Empowerment. Our goal is to help like minded people share stories, while bringing light, love and joy to each other. We hope you enjoy out latest Soul Lives book. Give it as a gift of love to someone dear to you. A timeless reminder of light, this book can be read and reread year after year. Soul Lives is a collection 101 feel good stories that is based on the belief that stories of goodness and love transforms us at the core of our being. It’s hard not to shed a tear of gratitude, feeling thrilled to have been touched and soothed so easily. Many for the stories have a short, simple tale to tell about an event, a person, an everyday miracle that amplifies the best in the human spirit. These stories have touched the warmed the hearts of people everywhere. They bring you hope and wisdom, joy and empowerment to move you through life’s toughest moments. If this ground breaking book you will will learn that there are people who really care about others… You can be the same and know you will be a happier person for it. Each day can become a feel good day with our 101 inspirational stories. Strengthen your relationship with God by taking a few moments a day to contemplate the depth of these stories. This compilation has been professionally collated and compiled as a beautiful PDF eBook. Read right from your computer or print out for leisure reading. You simply cannot lose! Invest In Soul Lives! 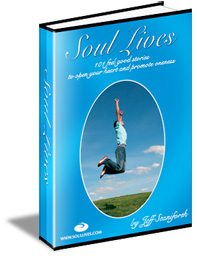 Soul Lives combines spiritual wisdom with the practical aspects of everyday living to make sense of life’s journey. The timeless message of Soul Lives is that we are each responsible for our own reality. We create things in our lives by the thoughts we think. Our secure server will process the order immediately, and you will be able to download this entire package within seconds. Order Soul Lives Right Away! It’s Only $24.95! Thanks to my Money-Back Guarantee, You’ve Got Absolutely Nothing to Lose! If you are not completely satisfied with Soul Lives, simply notify me within 8 weeks days and I will refund your money, in full, with absolutely no questions asked! Get your copy of the SoulLives right away by Clicking Here To Order Now!